(1) Nârada Muni said: 'Prahlâda, even though he was but a small boy, considered every blessing that came with his bhakti yoga an impediment on the path and this he with a smile told the Lord of the Senses. Third revised edition, loaded March 3, 2019. Nârada Muni said: 'Prahlâda, even though he was but a small boy, considered every blessing that came with his bhakti yoga an impediment on the path and this he with a smile told the Lord of the Senses. S'rî Prahlâda said: 'Please do not allure me, for because of my Asura birth I am, by all those blessings, attached to material enjoyment. It was out of fear for such material association that I, desiring liberation, have taken to Your shelter for the sake of complete detachment. Oh Lord, You send Your devoted servant into this world of desire to put his character to a test, for the lust to enjoy the senses, being the root cause of one's wandering around here, is found in the heart of everyone, oh Master. Oh guru of the entire creation, because You are so kind to Your souls, it does not work otherwise with You [being their Well-wisher]. Anyone desiring material benefits from You [will obtain them, although he] is [then] not your servant but a merchant [see also B.G. 17: 20]. Someone who for himself expects material benefits from his spiritual master is not really a servant. Nor is the master really of service who - for his own prestige - wants to bestow material benefits upon his servant [see also 10.88: 8-10]. There is, as far as I am concerned, in my full devotion unto You, no question whatsoever of any desire, nor do You, as a real master, foster any further motive for our sake, like a king does have with his subject. And if You would like to fulfill a desire of mine, then I pray for Your benediction, oh Lord of All Blessings, that no desire for any form of material happiness will grow in my heart [see also S'rî S'rî S'ikshâshthaka verse four]. From the moment they appear [the functions of] one's senses, mind, life air and body, one's religion, patience, intelligence, shyness, opulence, strength, memory and truthfulness are defeated by them. Only when one gives up all the desires that one in one's human association finds in one's mind, one is fit for an opulence equal to Yours, oh Lotus-eyed Lord. The Supreme Lord said: 'Those persons who, like you, are exclusively devoted to Me, do not desire any benedictions from Me in this world nor in the next. Nevertheless you may, until the end of Manu's reign, enjoy all the opulences of the Daitya rule out here [see also 2.3: 10]. Devote yourself to My pleasing stories, be absorbed in Me, who resides in your heart as the One present within all living beings. Worship, in [yoga] uniting your consciousness, the Lord who is the enjoyer of all sacrifices and give up your self-interested activities. By relishing your merit being happy, by acting piously defeating sin, by the rapid progress of time forsaking your body and by spreading your reputation throughout even the worlds of the gods, you will, freed from all attachment, turn back to Me. The Supreme Lord said: 'With the purification of your father, twenty-one of your forefathers have been purified, oh sinless one. Because you, oh saintly boy, took your birth from him in this dynasty, you in fact are the purifier of the dynasty. Wherever and whenever there are My devotees who, full of peace and equipoise, with the best qualities, are equally graceful towards all, everyone will be purified, even when it concerns the worst of societies. They will never, in whatever way, wrong any higher or lower living being, oh King of the Daityas, because they, in their love for Me, have forsaken all material aspirations. Persons in this world following in your footsteps become My pure devotees. You are truly the best example of all My devotees [see also 6.3: 20-21]. My child, you should now perform the funeral rites for your father, who in every respect was purified by the touch of My body and thus will be promoted to the worlds of the good people. S'rî Nârada said: 'As was ordered by the Supreme Lord, Prahlâda performed all the rituals associated with his father's death, oh King [Yudhishthhira], and was crowned by the brahmins. Brahmâ, who had witnessed what had happened, with a face radiating because the Lord had been pleased, offered with transcendental words the purest prayers to Lord Nrisimha, addressing Him in the presence of all the other gods. S'rî Brahmâ said: 'Oh God of gods, oh proprietor of the entire universe, oh love of all creation, oh first among the living beings, because of Your resolve [to protect the devotees] the most sinful Asura, who was of so much trouble to everyone, has been killed. I granted him the rare benediction that he would not be killed by any creature created by me and that he would not die because of any austerity, mystical or physical power. Thus being very proud he transgressed all injunctions. His son, who despite his young age was a great saint and exalted devotee, has luckily been released from the clutches of death and enjoys now, as You wished, Your shelter. S'rî Nârada said: 'This, oh King, is what the Supreme Lord said, and after Hari had been worshiped by the teacher of all teachers, He who cannot be seen by ordinary living beings disappeared from the spot. Prahlâda thereupon bowed his head and offered his obeisances with prayers to Lord Brahmâ, Lord S'iva, the founding fathers and the [other] demigods, who each are part of the Supreme Lord. Next Lord Brahmâ together with S'ukrâcârya and other sages, appointed him ruler over all the Daityas and Dânavas. Oh King, after Brahmâ and the others were properly honored, all the godly souls congratulated him, wished him all the best and then returned to their abodes. The two associates [the gatekeepers] of Vishnu who were born as the sons of Diti and who operated as His enemies, were thus killed by Him, the Lord residing in the core of the heart [see 7.1: 36-39]. Being cursed by the brahmins, the two were born again as the demons Kumbhakarna and ten-head Râvana and again both killed [by Him], thanks to the special powers of Lord Râmacandra. Slain lying on the battlefield with their hearts pierced by Râma's arrows, they with their minds fixed on Him gave up their bodies, just as they did in their previous birth. The two again appearing in this world with their births as S'is'upâla and Dantavakra, were the same way bound to the Lord in enmity and merged with Him [for the last time] in your presence. All the kings inimical to S'ri Krishna were, upon their death reaching His Self, freed from the burden of the sins of their previous life, just like larvae that obtain a body identical to the one of the drone that guarded them. Just as one by devotional service returns to the Supreme Personality, kings like S'is'upâla returned home and attained the same supreme nature of the Lord by contemplating Him [in their enmity, see also B.G. 4: 9]. All of this I described to you in reply to your inquiry on how, even hating, the son of Damaghosha [S'is'upâla] and others could attain the same position of wholesomeness [see 7.1: 34-35]. In this narration about the Supersoul and the Godhead of all brahmins, Krishna, I spoke about His incarnations in which He, among others, put an end to the Daityas. This history describes the character of the devotion, spiritual knowledge and renunciation of that most exalted devotee Prahlâda. Try to understand each of these stories and thus discover what belongs to the Lord, the Master of maintenance, creation and destruction, what His qualities and activities are, the wisdom handed down [in disciplic succession] and how He, by the time factor, stands for the finality of all the higher and lower living beings and their cultures, however great they might be. With the help of this narration, in which the transcendence is perfectly and fully described, one may get to know the Fortunate One and what the bhâgavata dharma [see 7.6: 28], the way of the devotees, entails. Anyone who, after hearing this pious narration describing the Supreme Power of Vishnu, repeats it or sings about it with faith, will be liberated from being entangled in self-interested actions. He who with great attention reads and listens to this story about the activities of the best of all truthful souls, this Daitya son, and how the Original Personality, playing the part of the lion king, killed the king of the demons who was as strong as an elephant, will attain the spiritual world where one has nothing to fear. Oh, you [Pândavas] in your human world, are extremely fortunate, for the Supreme One of the Absolute Truth, He who is always sought by the great saints who purify all the worlds, resides in your house in a human form. He is the Brahman of the Absolute Truth sought by all the great souls. He, who is factually your nephew [the son of your maternal uncle], He, your most dear well-wisher, is the oneness of transcendental happiness and the source of all life. He who is there also as your guru of instruction concerning the regulative principles, is the One to be worshiped as the completeness of the [body, the universe and the] soul. Lord S'iva, Lord Brahmâ and others could not even by meditation directly see Him or describe Him in His real form. May He, this great master of all devotees, be pleased with the silence we observe, with our devotion, our calm and our worship. Nârada said: 'After all the Asuras were defeated in battle by the God-conscious souls with His support, they took shelter of the greatest and best of them all, Maya Dânava. The demon constructed three big and mighty cities made of gold, silver and iron. Possessing the uncommon ability to move [hover] around in formation they were difficult to discern. Thus hidden from view the Asuras, mindful of their former enmity with the three worlds and their controllers, oh ruler of man, started to wreak havoc in the world. To show them his favor the All-powerful Lord said to the Suras: 'Do not fear', and fixed an arrow on his bow to launch his weapon at the cities. After being released his arrows shone with a ring of light as bright as the sun, so that the cities no longer could be seen. Under their attack the inhabitants of the cities fell lifeless to the ground. The great yogi Maya Dânava then dipped them one after the other in a well of [life giving] nectar [called mrita-sanjîvayitari]. Touched by the divine nectar, they rose from death as strong as thunderbolts splitting the sky with flashes of light. Seeing how disappointed and unhappy [S'iva,] the Emblem of the Lord was at the time, the Almighty Lord Vishnu considered what measures should be taken. Lord Vishnu then personally assumed the form of a cow, while Lord Brahmâ assumed the form of a calf, and together they entered in broad daylight Tripura to drink all the nectar of the well. Even though the Asuras took notice of it, they could, in their bewilderment, not stop them. The great yogi Maya, aware of what happened, considered it a matter of divine ordinance and thus he addressed those who were guarding the well. Having been quite content with their illusion [of victory] they now were greatly dismayed. 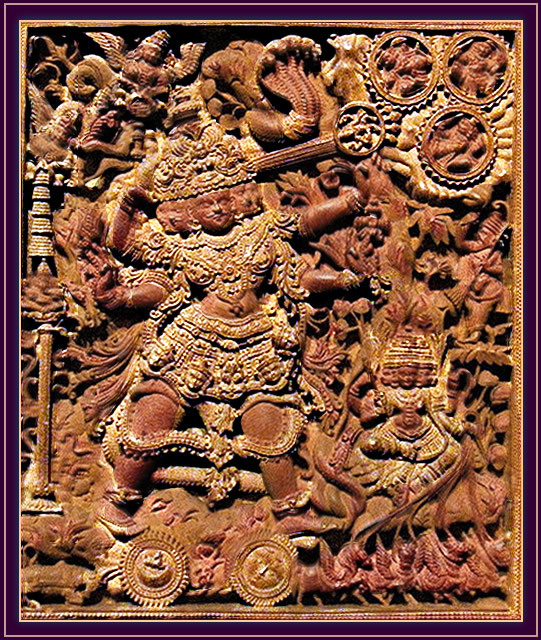 He [Lord Vishnu] thereafter equipped Lord S'iva with all necessities, like a chariot and charioteer, a flag, horses and elephants, a bow with shield and arrows and such; all matters that derived their strength from His personal dharma, spiritual knowledge, detachment, opulence, penance, culture, actions and so on. S'iva, seated on his chariot, then fixed an arrow on his bow. Oh ruler of man, with the arrows joined on his bow Lord S'iva thus, being the Master and Controller, at noon set the so difficult to pierce three cities afire. All the gods and saints, the ancestors, the perfected souls and the great personalities, then from their celestial chariots in the sky, with the assistance of countless kettledrums, loudly vibrated 'Jaya, Jaya', while they showered a wealth of flowers on his head and danced and sang in great ecstacy together with the beauties of heaven. Oh King, after the mighty Lord S'iva, who had burned Tripura to ashes, thus was glorified by Lord Brahmâ and the others, he returned to his abode. with Nrisimha. Date around 1700. Source. © Creative Commons 2.0, originally posted to Flickr by Redtigerxyz.